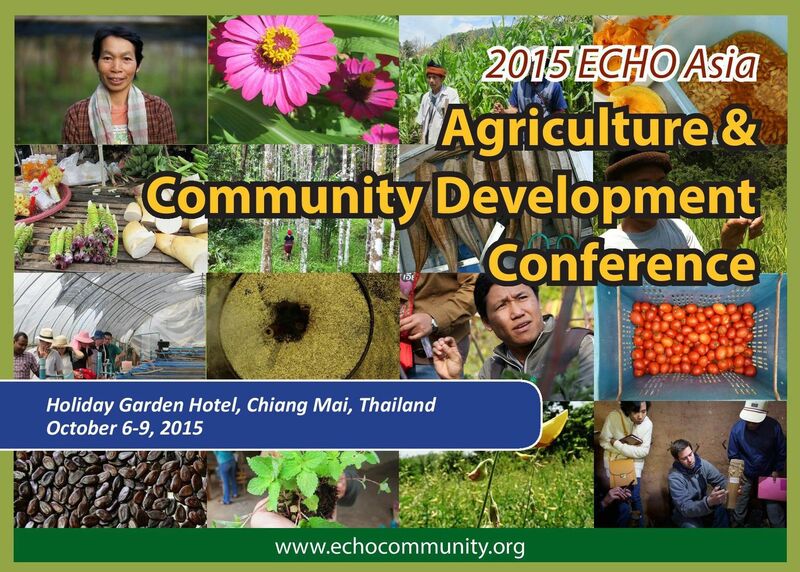 The 5th Biennial ECHO Asia Agriculture and Community Development Conference will be happening from October 6-9, 2015 in Chiang Mai, Thailand. The theme for this conference will be “Equipping Workers.” ECHO Asia is looking forward to bringing together a wide and diverse assemblage of NGO workers, agriculture missionaries, development agents, farmers, and organizations from across Asia for a time of mutual learning and encouragement that will bring forth an abundance of practical applications. Mark your calendars now and keep posted on ECHOcommunity.org! Please note: This event is currently full. If you would like to be added to a waiting list, please e-mail the event contact, Rebecca Garofano. The conference will be hosted in English, with translation for morning plenary sessions and afternoon workshops offered in Thai and Mandarin. These conference registration packets include: all conference costs, lunch, coffee breaks, sample packets of seed, and post-conference tours (except for a couple of exceptions, which require an additional charge). Registration will close September 18th. Conference fees can be made by PayPal or Bank Wire Transfer. Attendees will be sent an invoice shortly after registering. If registering for the "Shared Room" or "Single Room" package, these costs also include four nights of stay at the Holiday Garden Hotel (5th, 6th, 7th, & 8th) and breakfast. All three of the conference registration types include lunch and coffee breaks. In addition to the plenary and workshop sessions, this year, we also would like to invite delegates to participate in a poster session as a means to share and exchange other information. This might be a particularly suitable venue for any research or information which academics, graduate students, or practitioners have conducted or created regarding experimentation, crop evaluations, or to showcase an agricultural development project. Presenters are asked to submit a brief title and synopsis (2-3 sentences) ahead of time, and e-mail those to echoasia@echonet.org. Dr. Paul McNamara from the University of Illinois and Director of the Modernizing Extension and Advisory Services (MEAS) will share about lessons learned from agriculture extension best practices. Mother and daughter team, Wanpen Channarod and Phicharinee Suksree, innovative farmers from Nakhon Sawan, Thailand, will share about recent innovations in the System of Rice Intensification (SRI) and lessons learned. Dr. Sabine Scheucher is a botanist and horticultural therapist from Austria who has worked in Nepal, Tibet, and North-India. She will be sharing her research on culinary herbs, specialty greens, and highvalue fruits as an alternative for small-scale farming in the tropics and sub-stripcs. Dr. Bhuwon Sthapi, senior Scientist and Regional Project Coordinator for Bioversity Nepal will speak on community seed banking. Natural building at Mae Mut Garden farm and small farm resource center. Tropical forest restoration and stewardship with the Chiang Mai University Forest Restoration Research Unit (FORRU). Community-appropriate biochar research and application at the Warm Heart Small Farm Resource Center. Integrated Pest Management and Biological Pest Control at the Chiang Mai Pest Management Center. System of Rice Intensification with a visit to a Northern Thai farmer’s field in the Chiang Rai area. Fa Mui has grown organic brown rice and produced GABBA using SRI for over four years. Coffee farming, processing, and cupping. Dairy farming and farmer cooperatives with a local Thai dairy cooperative.